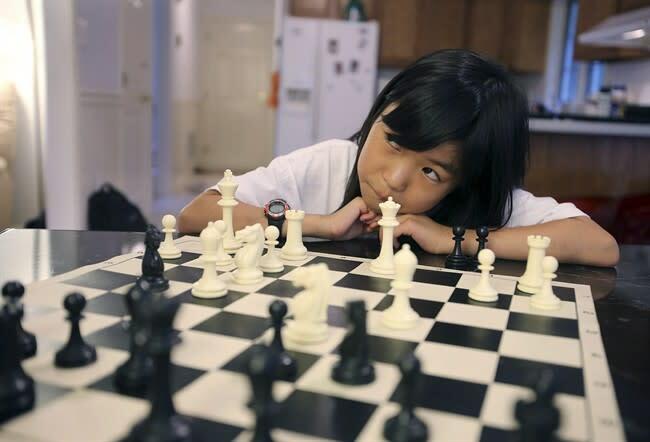 Carissa Yip, nine, started playing chess three years ago. This month, the Massachusetts Grade 5 student became the youngest female to reach the expert level (a rating over 2,000) since the U.S. Chess Federation started electronically keeping records in 1991, the Associated Press reported. She is currently in "the top seven per cent of all players registered with the group and the top two per cent of female players" — and is the top-ranked player at Wachusett Chess Club near her family's Chelmsford, Massachusetts, home. Yip's father, Percy Yip, told the Lowell Sun that she might reach the master level (a rating of 2,200) as soon as next year. "Some never reach master level," he said. "From expert to master, it's a huge jump." Yip has three years to set the record for youngest master. Five-time U.S. women's winner Irina Krush currently holds the record for becoming a master at age 12. Watch the young chess expert challenge a Lowell Sun reporter to a game of chess — without even looking at the board — below. "She has been called an intimidating player in an ironic way, because she's far short of even five feet tall," the Lowell Sun reported. Yip hopes to one day become the first female to win the overall championship — not just in the female category.